2016 DE to see the difference !! the color is also darker. In the mouth, it is very pleasant, on this peat associated with sherry impregnated one in the other. the fruits are cooked, macerated, on the candied orange peels, a little moldy wood, a little nut, the characteristic smoky is sweet, there is a little seaweed, a little dry smoke too, the spices are sweet, amplifying just the flavors, that's especially a relative softness with the 16 "basic" that I like too! the finish is quite long, on the same scents, a little more intense woody and the softness of wood and cold ashes at the bottom of the glass! The Lagavulin DEs have always been my favourite ones. 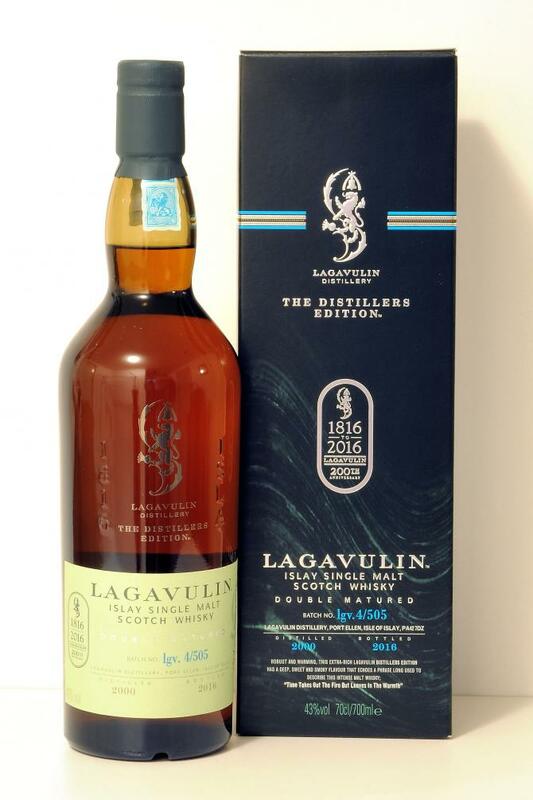 So lets see what the 2016 Edition is about.Nose: Typical peat smoke and burning wood, complex with fine vanilla and caramel toffee, maritime salty algae notes. We got some fruity notes of dates, honey and sweet raisins, too. You definitly want to try this one!Taste: Maybe I had too many Islay drams, but this is not as smoky and peaty as I expected it. Some medicinal saltiness and dark chocolate is what makes the bigger part. I also had coffee and these sweet notes from the sherry-casks. Really a solid Distillers edition here.Finish: This one becomes really sweet in the end. Fine notes of smoke and oak mixed with this great dark chocolate aroma. Almost never ending. In my opinion this is quite a gem for only 79€. Much more complex than the regular 16 year old. The sherry casks make it just delicious. [May, 2017] I had this dram during the Manager's Masterclass tasting at the Feis Ile.As usual this is a nice and easy-to-sip Islay dram with a bold profile. The yearly batches vary a little but still all are on a high quality level. This dram proves: Excellent whisky need not to be very expensive! Aroma: Intense peat and vanilla. Sweet Roses keeps the smoke at bay. Iodine peat and crispy roasted malt. Taste: Full and rich body. Sweet and delicate on the palate; a clear, grassy malt, then peat attacks, smoke fills the mouth. Sometimes very salty seaweed; in the middle coffee and vanilla with a glimmer of fruit. Finish: Incredibly long, even for an Islay Malt. Fruit, peat and long-lasting oak. A whisky "to chew" that makes you want more.